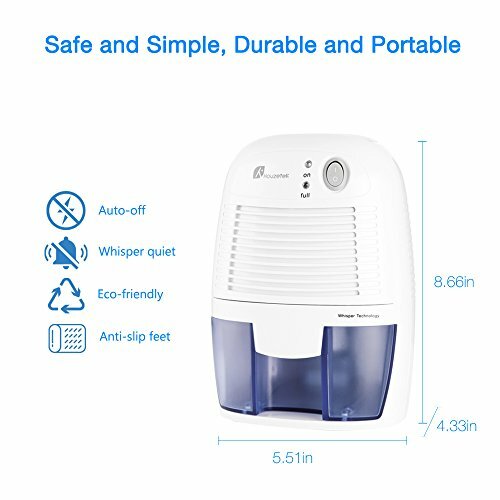 COMPACT MINI DEHUMIDIFIER - Small and compact dehumidifier with 16 ounce / 500 ml capacity tank extracts up to 9 ounces / 250 ml of moisture daily to purify air in enclosed and small rooms and spaces. 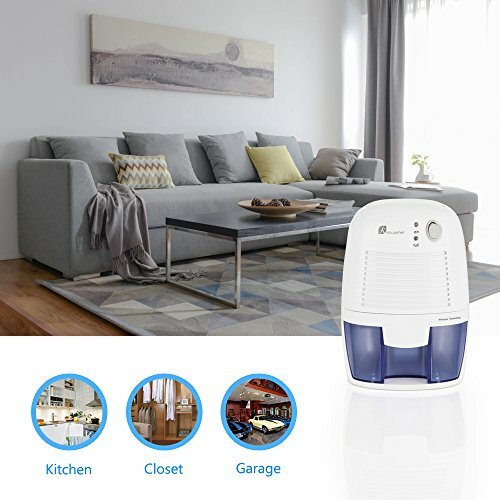 QUIET & ENERGY EFFICIENT AIR DEHUMIDIFIER- Features low noise thermoelectric peltier module and energy efficient 25W ETL certified adapter to prevent overheating for safer use. Ideal for use at night with low energy consumption. 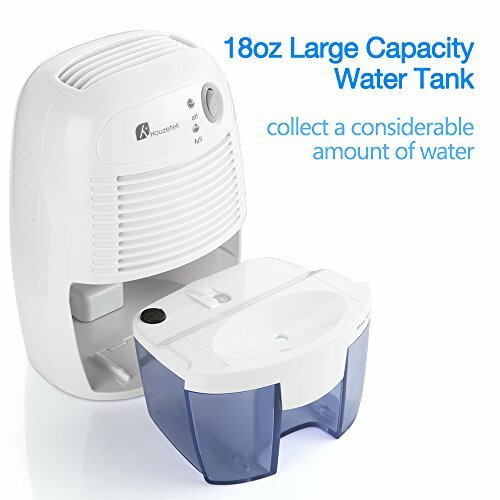 AUTO SHUT OFF DEHUMIDIFIER FOR BASEMENT- Quiet dehumidifier shuts off automatically and triggers LED indicator light when the tank is full and water is ready for removal - a convenient option for closets, bathrooms, showers, gun safes and more. 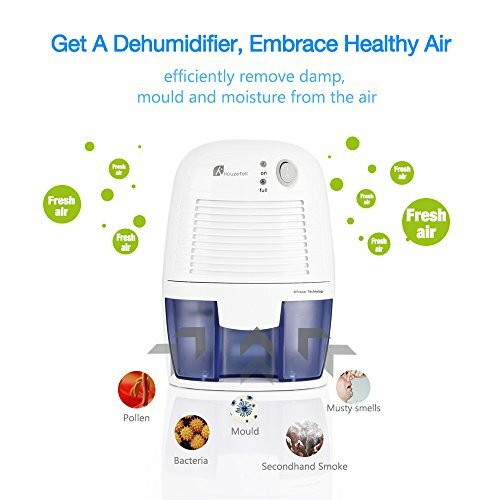 DEHUMIDIFIER FOR HOME up to 150 SQ FT - Best for removing moisture to keep your home free from irritating allergens like dust mites, mold, and mildew providing a healthy working and living environment. 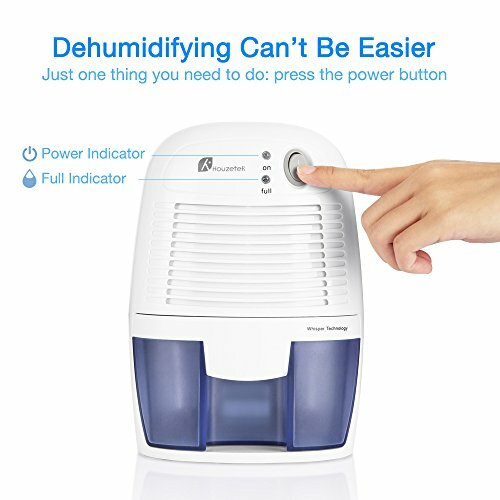 THERMOELECTRIC PORTABLE DEHUMIDIFIER - Handy lightweight home dehumidifier measures 6.5 x 5.3 x 8.5 inches, makes it convenient to move from room to room, and its suited for 110V power supply with 2 flat pin plug (9V / 2.5A). 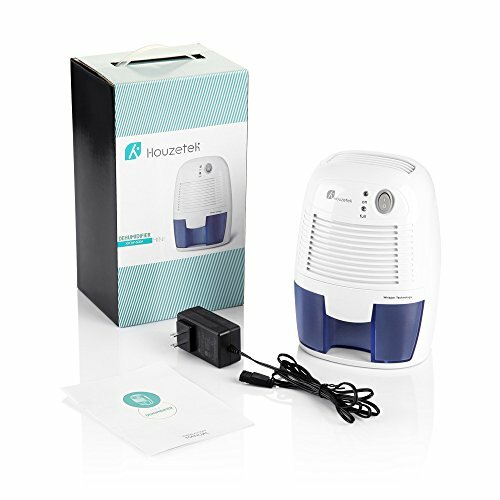 Houzetek Compact Dehumidifier works to eliminate moisture from small, enclosed spaces and refresh the environment around you. 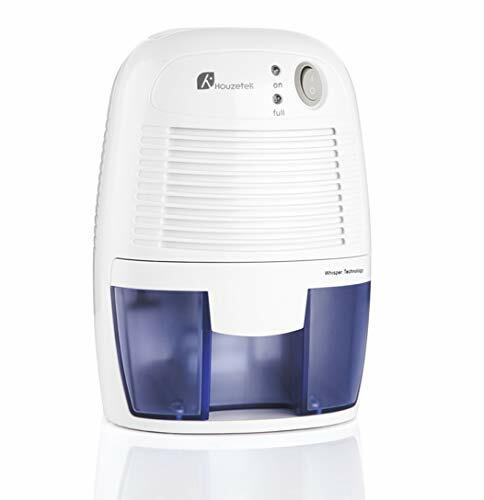 This Air Dehumidifier intakes humid air, removes the moisture, and releases it back into the room for easy, healthier breathing. The moisture gathers in the collection tank, which shuts off automatically when the tank is full and ready for removal. Once the tank is emptied and put back in place, the dehumidifier can be turned back on and the process begins again. Keep the humidity out of indoor spaces to help protect clothes, home goods, and furniture from mildew, mold, and moisture rot. 1. Connect the power adaptor to the dehumidifier and main wall socket. 2. Switch the dehumidifier ON using the ON/OFF switch. The GREEN LED will on the you will feel a little breeze blowing out of the dry air outlet. 3. To switch OFF, press the ON/OFF switch again. then pull out rubber plug on the water displacement hole, empty the water from this hole. Put the rubber plug back, at last slot back the water tank before turning on. Ensure the dehumidifier is OFF and unplugged from the wall socket and use a soft cloth to clean away dust or debris from the surface of the unit and air inlets.